G1. All in all a pretty good show. GI Joe renegade isn't as good but I liked it. In this version cobra is pretending to be the good guys and the joes are seen as the bad buys. Crazy just thinking about it. On a different note hulu has many old school toons like he man and she ra running on it. Adultswim has all of this seasons Venture Bros up on their site. I didn't love this season as much as others but a few of the episodes were the very best episodes of the series. RWBY is back for volume 6. Animation is improved, story is a little confusing, and action is a little down. You might want to watch a recap of volume 5 before going in. I recall someone asking about where they could watch Star Wars Resistance. The show is also on the disney app so that is option if you don't have the disney channel. I found it on my cable service’s on demand stuff. I can’t remember how many episodes are available so far. I haven’t watched it yet, but it looks... interesting? I can't recommend it. Kids might like it which is odd since it airs at 10pm. The show is just kind of forgettable. giant naked woman. I know if it was me all I want to be is a giant woman. One odd point I didn't understand is all the women pulling their weapons on the dude. Two of the ladies are related to him by blood. And he has been helpful. The over aggression seemed out of place. Watched The Death of Superman the other night. I liked that it was part of the current DC Animated Movie Universe. I'm looking forward to the 2nd part. Watched the first two episodes of new She-Ra on netflix and think it is lovely. I'm not a big fan of he animation but it isn't bad. Voice acting is great. The story was pretty good. Kids will probably love it. Adults might like it, the ladies might like it more than dudes. Maybe people might compare it to star wars resistance. I think it is much better than that toon. She-ra takes time for other characters. After 6 episodes of resistance all the side characters are still unknown for the most part. After first episode she-ra you get to really know a few characters. I actually decided to drop resistance, its just isn't doing anything for me. When through a few more episodes of She-Ra. Some of the voice choices are just bad, surfer dude and valley girl. It kind of takes me out of the world hearing those voices. The show is still overall good though. Really enjoying She-Ra so far. Bow is great. My 11yo daughter had been watching the OG She-Ra, sort of ironically. Then last night she turned on Netflix and discovered the new one. I have mixed feelings about it. I sort of feel like they could have done a much better job on it. Finished She-Ra and thought it was great. Will love to see a new season. I got around to watching The Killing Joke and thought it wasn't half bad--at least not as bad as I was expecting it to be given the reviews I'd read about it. It definitely felt disjointed in the middle though. Binge watched the first 5 episodes of She-Ra last night. I like it! It reminds me in some ways of Steven Universe and that's a good thing. I think it's funny when Bow gets all starry-eyed just like Steven over something cool. Finished She-Ra last night and while I generally thought it was good, the season 1 ending was too abrupt for me. I was actually hoping that they were going to leave it as a major cliffhanger instead. Still though, I agree with Baron and would be looking forward to a 2nd season. It would be great if they would continue to explore each character's inner conflicts and have them question or even change their allegiances throughout the series. It'll be much less interesting if the current set of good and bad folks are now set in stone. This series wins the award for the most realistic exasperated sighs. Scorpia is the BESTEST and I'll claw-fight anyone who says otherwise! i still have to catch up with SU, I've fallen a bit behind. OMG, it's about time! SU FTW. Scorpia is absolutely the best. I'm loving She-Ra! I'm really amazed at how well the villains are characterized. Not everyone in The Horde are Saturday morning cartoon villains. I was concerned after watching the trailer that the shading was extremely flat, but it hasn't bothered me. Unlike Marvel Rising: Initiation, which almost ruins the whole thing with its horrible horrible horrible flat colors; I haven't looked at Marvel Rising: Secret Warriors yet. Maybe in this show we'll see the dream come true, the rpg hero winding up with the cat girl. All I know about the difference from the original is that in the original, Hordak is the one who raises Adora as his own. Geez, the names of everyone (one of them even says "Net-Tossa. Get it? I toss nets! "): I've decided it's kitschy and I love it. I literally don't remember seeing her or the other one before that last episode whatsoever. Swift Wind is a great horse! She was high on my list for favorite character but then they had to make her a villain, but hey, I'm sure this show will feature the theme of learning from one's mistakes so I'm hopeful she'll be turned around. Of course it's hard to have a full good vs evil fight without notable villains. I was hoping someone would say that last part, because I thought of a retort before I came here! Which is this: in what universe is there a reboot of a spin-off of He-Man that is better than this! Also Season 8 of MLP:FiM is on Netflix. If only we can get the second half of season 2 for Miraculous Ladybug, I'll be pretty happy. Geez, the names of everyone (one of them even says "Net-Tossa. Get it? I toss nets! "): I've decided it's kitschy and I love it. LOL, no kidding. Remember that the original 80s She-Ra was essentially a 20 minute commercial to sell action figures (think He-Man, Transformers, GI-Joe, etc...) Thus the toys got their names according to their unique distinguishing feature or ability. I guess the creators thought it was easier for kids to remember. The new series wanted to be true to the original source material (all names kept intact) but I love the fact that they can be introspective about it. That scene was hilarious in that she sounded more like she was complaining about the fact that she had that name in the first place. She was a villain in the original series so that wasn't a huge surprise. 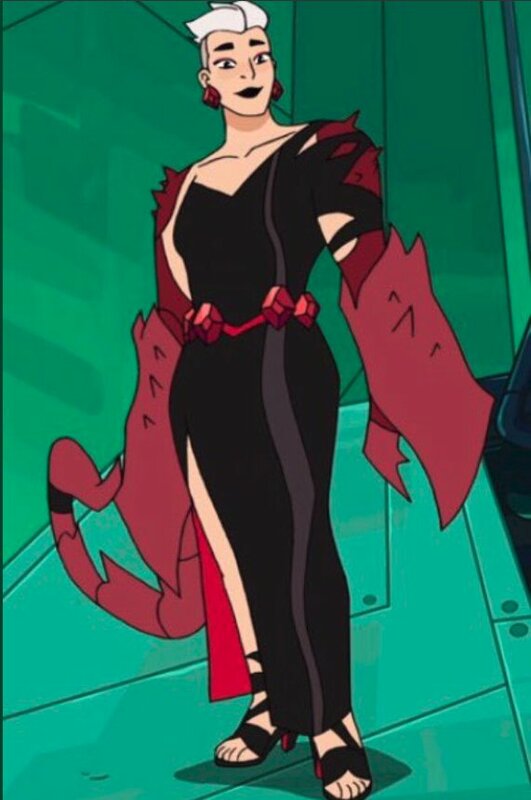 However, Scorpia being a princess was! Crossing my fingers she ends up defecting to the good guys side! +1 to that. I'm hoping that the "good" and "bad" characters aren't fixed in stone in season 2 and so that they can be swayed to help or hinder different sides. Entrapta seems like she is distinctly a-moral and is only interested in whatever lets her do her research. She seems like someone who could constantly switch sides so long as it suits her interests. I'm looking forward to the episode where Adora, Gimmer, Bow & company discover that she's alive and have to convince her that they didn't abandon her. the story of the cartoon didn't even match up with the story of the little comics that came with the toys form what I remember. (I saw someone mention recently tht Catra was always meant to be the main antagonist of the series, as per those original comics and that's why she's the main antagonist in the new show. Hordak was part of the Masters of the Universe toy range so technically he's a he-man villain. ).